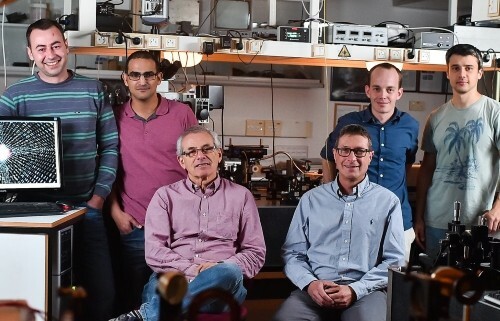 The prestigious scientific journal ‘Science’ announces a groundbreaking scientific discovery that demonstrates a photonic “Big Bang” in a Technion laboratory. Operating on a nanometric scale, the research team is led by Prof. Erez Hasman from the Technion’s Faculty of Mechanical Engineering. 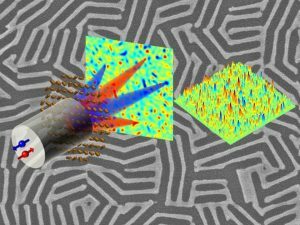 The journal ‘Science’ is publishing a groundbreaking scientific discovery by a research group headed by Prof. Erez Hasman of the Technion’s Faculty of Mechanical Engineering and the Russell Berrie Nanotechnology Institute (RBNI) at the Technion. The discovery demonstrates the transition from an orderly physical system to a disorderly system in optics on a nano-scale, and shows a photonic “Big Bang” in laboratory conditions, inspired by models in cosmology. “Our research deals with the development of nanometer scale optical devices and with understanding the interaction between light and tiny structures,” explains Prof. Hasman, head of the nano-optics labs. “The aim of the current study – that was published yesterday in the journal ‘Science’ and which was inspired by the ‘Big Bang’ model in cosmology – was to investigate the optical transition from an orderly to a disorderly structure. 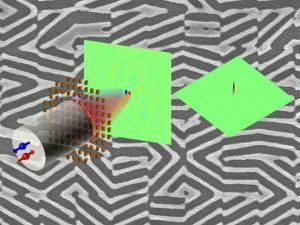 We tried to understand the mechanism of the topological phase transition (from an orderly to an extremely disorderly state as a result of breaking the symmetry) on a nanometric scale.” The research team includes graduate students Elhanan Maguid; Michael Yannai; Arkady Faerman; Igor Yulevich; and the researcher Vladimir Kleiner. The nanooptics Big Bang occurs when there is increased disorder and when the system reaches a critical point where there is complete disorder, meaning dispersal of the opposite spinning photons in every direction. The “photonic big bang” was demonstrated using nanometric metasurfaces based on tiny silicone antennas (nano-antennas). “Using nano-antennas that we produced in the lab using silicone technology, we developed a method to control disorder in the system – increasing the entropy,” elaborates Prof. Hasman. “Light is composed of photons, massless particles, travelling in a speed of light. Each photon behaves like a spinning top that spins either clockwise or counter-clockwise. (In scientific terminology: positive or negative spin). Members of the Nanooptics group led by Prof. Hasman who are partners in the study. From right: Arkady Faerman, Michael Yannai, Prof. Erez Hasman, Dr. Vladimir Kleiner, Elhanan Maguid and Igor Yulevich. A ‘photonic spin Hall effect’ occurs when an orderly state is transformed into a state of minor disorder, meaning that the angle of the nano-antennas is slightly altered. This effect is a spatial separation between photons spinning in opposite directions; photons with positive spins move in a certain direction and others with negative spins move in the opposite direction. 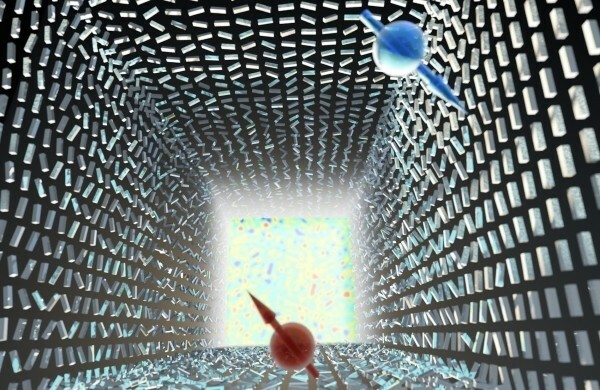 This is a very small separation on the nanometer scale, and therefore the researchers used an idea formulated by Prof. Yakir Aharonov from Tel Aviv University called ‘quantum weak measurement’, in order to measure the nanometric separation between the light particles’ two opposite spin states. The nanooptics Big Bang occurs when there is increased disorder and when the system reaches a critical point where there is complete disorder, meaning dispersal of the opposite spinning photons in every direction (in scientific terminology, this is called ‘the random Rashba effect’). The global scientific breakthrough took place in Prof. Hasman’s lab at the Technion, and describes the photonic “Big Bang” – a big bang on a nanometric scale based on light. The research provides inspiration for understanding disorder in solid states, and will impact the field of spintronics. Furthermore, it opens opportunities for designing artificial materials while controlling their level of disorder. Prof. Hasman is a world-renowned expert in nanophotonics – the interaction of light with nanometric structures. He founded the field of spinoptics and in recent years, Prof. Hasman and his research group developed multitasking nano-devices based on silicone nano-antennas, which can be used to generate light beams and combine a large number of optical components in a single nanometric element. Prof. Hasman is proud of his group’s enormous achievements. “Every year for the past four years, we published a groundbreaking article in ‘Science.’ As a result of these achievements, Elhanan Maguid was awarded the prestigious Wolf Prize for outstanding doctoral students in 2017. My research group laid the foundations in 2001 for the field of photonic nanoscale metasurfaces, which is today considered one of the hottest fields in optics, with many labs researching this field,” he states. Prof. Hasman’s group includes researchers from different disciplines, including Physics and Engineering Science, who take part in basic research as well as applied research that yields many applications for the high-tech industry. Prof. Hasman collaborates with Stanford University in the U.S. – a partnership that has led to groundbreaking joint studies and research projects, and which enables the researchers in his group to lead studies with their colleagues in the U.S. The research is supported by the Israel Science Foundation (ISF) and the components were executed at the Technion’s Zisapel nanoelectronics center (MNFU).